The Highway Loss Data Institute, a part of the National Institute for Highway Safety, has released its 2010 theft numbers. By comparing the number of insured vehicles on the road to the number of theft claims, HLDI creates the most-stolen list. This year, the Cadillac Escalade topped the list, and pickups are becoming more frequent targets. The number of theft claims have declined, though the amount paid out has been rising. With a huge engine, the Chevrolet Corvette Z06 is stolen .17 percent of the time with the help of anti-theft devices. With the highest average loss per theft, though, the $41,229 loss has insurance companies skittish about this vehicle. If you own a Nissan Pathfinder Armada, you have about a .45 percent chance of having it stolen. However, that insurance claim is more likely to be very costly — $12,458. This large SUV is has a claim frequency of about 5.7 claims per 1,000 insured vehicles. Average payment per claim is just a few cents less than $9,499. In addition to being the most likely to be ticketed vehicle, the Hummer H2 is more likely to be stolen. With average losses of $10,324 and a .62 percent chance of being stolen, the Hummer H2 can be dangerous to own. The only family car on the most often stolen list, the Dodge Charger HEMI is stolen 7.1 times out of every 1,000 vehicles. The Dodge Charger HEMI and Infiniti G37 both share a .71 percent chance of being stolen, but average payouts for the Infiniti G37 are just about $200 more. This very large SUV only has a claim frequency of .74 percent, but the average losses are almost $1,000 more than the Silverado 1500 — at $7,571. Pickup trucks are a rising concern when it comes to stolen vehicles. Very often, the average loss is higher because trucks have expensive tools. About .8 percent of Silverados are stolen. Almost one out of every 100 Ford F-250 pickups are stolen, with a claim frequency of .97 percent. 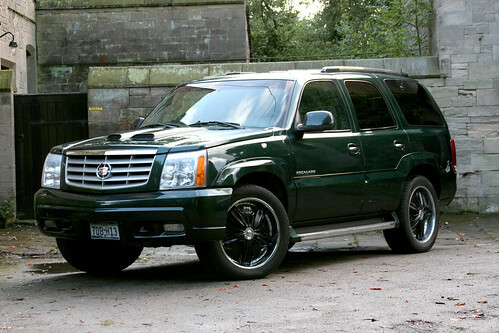 Topping out the list of stolen vehicles and most stolen SUVs is the Cadillac Escalade. With 1.08 percent of these vehicles stolen and a average loss per claim of $11,934, the Escalade is an expensive vehicle for insurance companies to take on. Cadillac Escalades have topped the list since 2002 — car thieves are in love with it! No matter what type of anti-theft technology they put into it, they'll keep finding a way. If they can't hot-wire it, they'll take every piece of the vehicle apart and run.